Michael Franti and Spearhead: still active. When most musicians find themselves with a couple of days off tour in Florida in the middle of May they either hit the beach, play golf, or go clubbing with any number of Miami Heat players. You know, the usual. Yet singer/songwriter/filmmaker/humanitarian (the list goes on) Michael Franti is refreshingly unusual, and when faced with a similar situation, he chose a far less glamorous vacation. In many ways, Franti, who plays Ives Concert Park in Danbury, with Grace Potter and the Nocturnals on June 27, is a professional communicator. He travels to countries devastated by natural disaster, disease and war, and communicates their strife through song, and most recently film. In his 2005 documentary I Know I'm Not Alone, Franti examined the cost of war in the Middle East, not from a monetary or political perspective — as is often the focus of the mainstream media — but from a humanitarian perspective. In Haiti, he again hoped to let the people tell their own story, simply interviewing men and women he met while playing his guitar. Franti is best known for fronting the band Michael Franti and Spearhead, who enjoyed recent success thanks to the single “Say Hey (I Love You)” off of 2008's All Rebel Rockers. Since the mid-‘90s, the band has been creating upbeat, reggae and hip-hop- infused rock, while lyrically remaining topical. 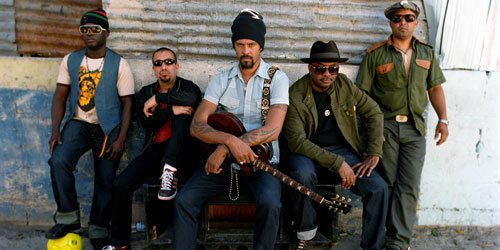 Though Franti has just begun the writing process for the group's next record (due out spring 2012), he has found difficulty remaining positive amidst the suffering he sees in his travels. “It's hard …most of my songs start off as sad songs and I have to shape them into optimistic songs,” he says. It's Franti's sincerity and selflessness that keep him from coming off as some kind of dreadlocked Bono. He has little to gain personally from his humanitarian efforts (his documentaries are self-funded and his record sales are for the most part modest), yet he won't stop.